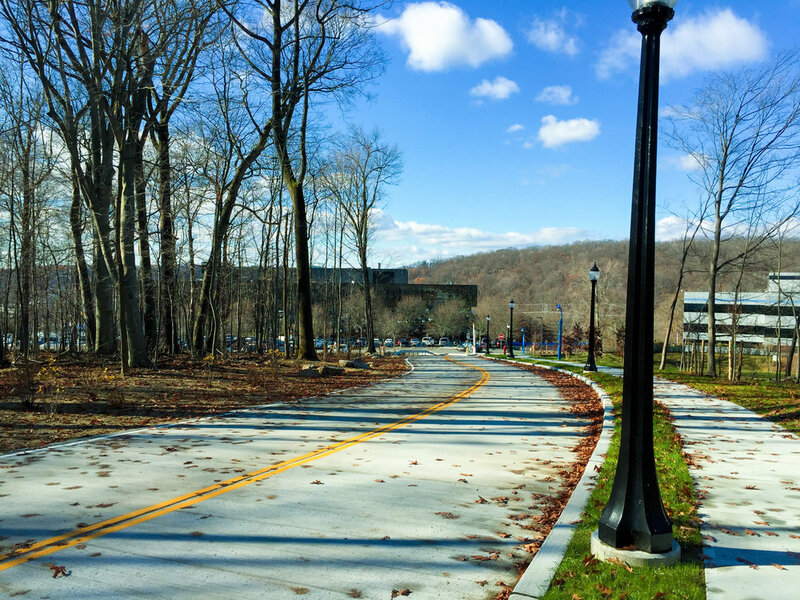 In order to provide a direct connection between the New York Medical College and a newly acquired building and parking area adjacent to the NYMC campus, a new vehicular and pedestrian access roadway was needed. The proposed roadway required crossing through environmentally sensitive areas that included woodlands, steep sloping terrain and wetlands. The existing campus roadway was heavily traveled with difficult geometry, making locating the intersection difficult. PS&S developed a roadway layout avoided impacts to wetlands and heavily wooded areas. To limit tree removal and overall disturbance, PS&S located the road along an existing gravel pathway. Green stormwater practices were utilized to eliminate the need for a stormwater detention basin and further disturbance. The project included the realignment of the existing County-owned campus road to increase the curve radius at the point of connection of the new roadway improving site distance.